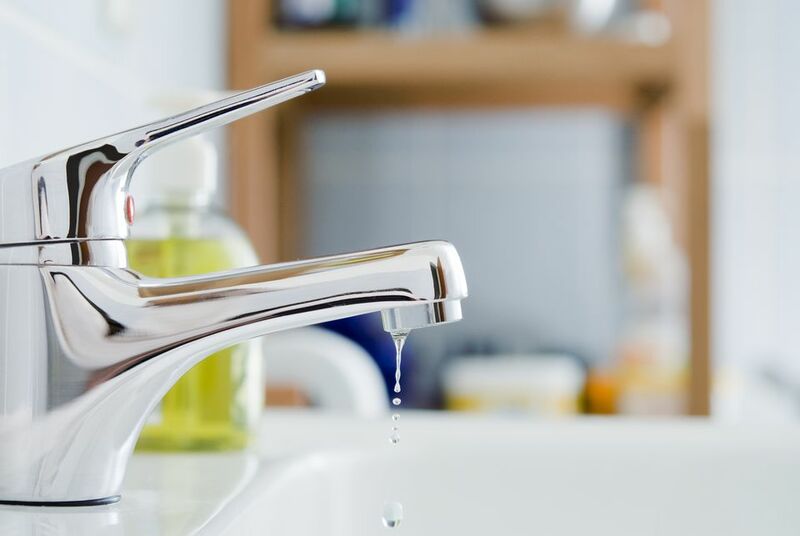 Some faucet leaks are pretty obvious to spot—when a faucet drips from the spout, even when the handle is turned off, there is no misunderstanding about the fact that your faucet is leaking. However, not all faucet leaks are that obvious, and they can occur in places other than the spout itself. If your household water usage is higher than normal, look for less obvious faucet leaks that may be wasting water. There are three common locations for faucet leaks. This is where faucet leaks are most obvious and visible. The faucet will start dripping or running even when the handles are shut off. You may notice that the faucet handle has to be turned a little tighter each time you turn the faucet off. Or, after the faucet is used, you may find it necessary to adjust the handle to tighten it or position it just right so it doesn't drip. These are the most common faucet leaks, and a small drip will get worse over time and eventually add up on your water bill. This constant drip-drip-drip can also begin to stain the sink if it is not remedied. In advanced cases, the dripping will be obvious and constant, but in the early stages, it may be so intermittent that you don't yet notice it. If you suspect a spout leak, you can use a paper towel or small container to test it out. Dry the sink up after using the faucet, then place a dry paper towel under the spout over the drain opening and check back later to see if it is wet. A cup or bowl properly positioned under the faucet spout can also work. The fix for this kind of faucet leak will depend on the type of faucet you have. If you have a compression faucet—the kind where the handle feels like it screws down and you feel the stem compressing on an inner washer—then replacing the washer (or washers) on the end of the faucet stem is the proper repair. More often, though, modern faucets use cartridge inserts. Here, the repair will be to replace the faucet cartridge to remedy the leak. Compression faucets are somewhat rare now, for the simple reason that they require frequent maintenance and have largely been replaced by more trouble-free cartridge faucets. If you have a compression faucet that uses old-style washers, it may be well worth the expense of replacing it with a newer cartridge model. A leak around the base of the faucet, where the faucet body meets the sink, is not quite as obvious since users are constantly splashing water around sink deck and base of the faucet. But if you frequently see puddling water on the sink deck around the faucets, you may have a leak in this area. In these situations, the leaking occurs only when the faucet is turned on. To check for this kind of leak, start by drying up all the standing water on the sink. Then, turn the water on (both handles if it's a double-handle sink) and look carefully for water seeping around the base of the faucet. This type of leak is often caused by an internal O -ring that has dried up or cracked. The O-ring fits around the inner brass body of the faucet beneath the outer housing, and it serves to seal the faucet body against water. When it becomes worn or cracked, water can seep down along the faucet body and out the bottom when the valve is turned on. Less commonly, leaks in this area can be caused by an inner cartridge that has become worn. If fixing the O-ring doesn't help, you may need to replace the valve cartridge, as well. A leak under the faucet and sink can be the hardest to notice since most people don't even look under the sink on a regular basis. This can actually be one of the most damaging leaks, though, since this water has nowhere to go but onto the floor. Let unrecognized, this kind of leak can damage the floor or your vanity or seep through the floor where it can cause very expensive damage. These leaks can be very small, so if you can't immediately see the source of the leaking, lay some dry paper towels on the floor or bottom of the vanity and check back in a day or so for water marks on the paper towels. The water supply lines have three connections you should check: where the supply pipes connect to the shut-off valves; where the valves connect to the flexible supply tubes; and where those supply tubes connect to the tailpieces on the faucet itself. Any one of these locations could be the place where water is leaking. It's a matter of close inspection to identify the spot where the leak is occurring, then tightening the fittings to stop the leaking. In some instance, the shut-off valve or flexible supply tube may be worn out and need to be replaced. It's also possible, though less likely, that the faucet itself is worn out and needs to be replaced. In very old faucet, the tailpieces may have corroded so far that tight connections to flexible supply tubes are no longer possible. Not all leaking under a sink comes from the faucet. If it is the sink drain opening or the fittings on the drain P-trap that are leaking, this, too, is usually a matter of tightening the drain connections. On very old sinks, the drain strainer and tailpiece unit on the sink may be worn out. In this case, replacing the sink drain fitting will be required. More often, though, it will simply be a matter of tightening these fittings to stop the leak.